Discover the fate of a stricken merchant ship in this clever maritime mystery. What is it? A mystery set aboard a lost ship. The merchant vessel Obra Dinn drifts into port, crewless and mysteriously abandoned, having disappeared some years earlier. You climb aboard, an insurance investigator, and begin to try and make sense of what happened to the crew—with a little help from a magical pocket watch. This curious, arcane artifact, decorated with an ominous engraving of a grinning skull, lets you visit the moments before a person’s death in an attempt to establish what happened to them. But with the fates of sixty sailors to determine, this is no easy task—especially as Return of the Obra Dinn, a few lean tutorials aside, steadfastly refuses to hold your hand. This is a first-person puzzle game from Lucas Pope, creator of the acclaimed Papers, Please. 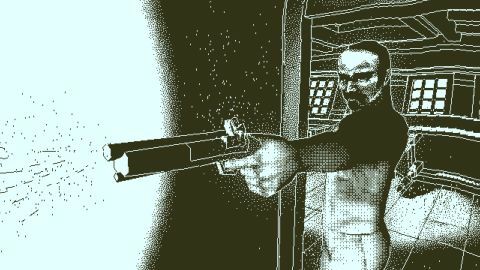 It’s completely 3D, but rendered with a bold, beautiful art style that recalls the 1-bit dithered visuals of old Macintosh adventure games. But the Obra Dinn is no less atmospheric for it. In fact, the sense of place created by its hard lines and limited palette is quite remarkable. As you explore the ship you’ll find piles of sun-bleached bones that used to be the crew, and activating the pocket watch near them will whisk you away to a static, but wonderfully detailed, vignette of the seconds before they died—be it an unfortunate accident, a brutal murder, or something altogether weirder. And it’s here where your investigation really begins. Determining the cause of death is normally the easiest part, because the evidence is right in front of you. You might see a man recoiling in pain as a shot from a flintlock pistol rips through him, or another taking a fatal tumble down a stairway. But the tricky part is discovering the identities of the people involved, which requires some real detective work. There are a few ways to find out who someone is. In some death scenes there’s a short snippet of dialogue, and you might hear a name being called out. Or you’ll have to look at where a person is on the ship, or what they’re doing, to establish their identity. It’s safe to assume the guy in the workshop sawing a plank of wood is the carpenter, for example. But then again, maybe he isn’t. Things are rarely that simple in this game. As well as the watch you have a notebook at your disposal. Here you can cross-reference your deductions with a manifest outlining the roles and nationalities of the crew, an illustration of them all gathered on the deck, and a glossary that explains some of the obscure, archaic nautical terms you’ll have to tangle with: often important clues to who a person is. Whenever you make three accurate deductions, the notebook etches your conclusions—name, cause of death, and in some cases their killer—into the book permanently. This stops you brute-forcing your way through the game, randomly selecting names for each crew member from the manifest in the hope one sticks. But it also left me feeling at a loss sometimes, with no indication that I was hot or cold with my (sometimes way off the mark) theories. But then something hits you. You’ll be fumbling around in the lower decks, bouncing your head off the oak hull, when something slides into place in your mind. A moment from a previously-visited death scene that suddenly resonates with the current one. An identifying mark on a sailor. An accent in a dialogue snippet. And in a brilliant Sherlock-style flurry you’ll snap more pieces of the jigsaw puzzle together and make the image a little clearer. These moments of success are rare, but all the more satisfying for it. A lot of my time with Return of the Obra Dinn was spent wandering the ship, tugging at loose threads, and seemingly getting nowhere. But knowing those moments of clarity were waiting to emerge kept me playing, even as the mind-map I was creating of the crew grew increasingly massive and unwieldy. The game paints a vivid picture of life aboard the Obra Dinn, and with each chapter—unlocked by exploring and locating more bodies—a larger story begins to take shape. I won’t go into specifics about what befell the crew, because getting to the root of that is the core of the game, but I can say that this has to be the unluckiest merchant ship in the world, with so much chaos and calamity occurring on-board it’s amazing the thing is still floating.